First, we would like to wish all followers of our blog a happy and healthy 2015. We look forward to continued successful legal outcomes for all of our clients in the New Year. Our copy of Black’s law dictionary defines a subtenant as “one who leases all or part of the rented premises from the original lessee for a term less than that held by the latter.” What this means is that, ordinarily, a tenant rents premises from a landlord, who is usually the owner of the property. The tenant may, in turn, rent her interest as a lessee to another party. That other party is generally known as a subtenant. 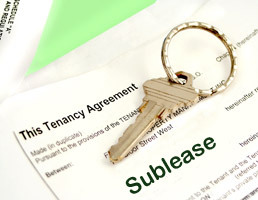 Of course, subletting a property to a subtenant creates many legal issues relating to the landlord-tenant relationship, which we will address in this post. The first issue is whether the tenant has the legal right to sublet the space to a subtenant. The answer to this question is usually found in the lease between the landlord and the over-tenant. The lease may expressly forbid subletting. In that case, the over-tenant is in breach of the lease if they sublet the space. In the alternative, the lease may allow subletting, but only with the permission of the landlord. Some leases will state that such permission is “not to be unreasonably withheld.” In such situations, we recommend obtaining the landlord’s consent in writing. That way, there can be no misunderstanding regarding whether the landlord has consented to a subtenant. Finally, the lease may be silent as to subletting. In such instances, courts have generally held that the subletting is not a breach of the lease and can be allowed. It should be noted at this juncture that many residential cooperatives and condominiums have their own rules on whether owners can sublet, and have restrictions on such subletting in their governing documents such as the proprietary lease and by-laws. It is important to examine the proprietary lease, house rules, or condominium by-laws to determine whether a sublet is allowed. Breaching these rules may result in sanctions and penalties or legal action from the cooperative or condominium, including fines and possible loss of the unit. The next issue to arise is when the over-tenant defaults on their lease, by failing to pay their rent, or by simply vacating the premises, leaving the subtenant in possession. In such an instance, the subtenant would retain a legal right to possession of the premises until the landlord brings a dispossess action and obtains a warrant of eviction from the proper Court. The landlord is not allowed to simply use “self help” in evicting the subtenant. The landlord must follow the proper notice and Court procedures even when evicting a subtenant. Failure to do so may result in a Court allowing the subtenant to temporarily remain in possession. Of course, an experienced attorney, such as those at our firm [link] will attempt to negotiate with the landlord in this situation and attempt to negotiate a solution satisfactory to both landlord and subtenant. Finally, there are situations where the subtenant violates their sublease with the over-tenant. For example, the subtenant may fail to pay their agreed-upon rent to the over-tenant, or may violate the sublease in other ways. In such a situation, the over-tenant becomes the “landlord” for the subtenant. Like the landlord, he cannot use “self help” in evicting the subtenant. Doing so may expose the over-tenant to a suit for damages for wrongful eviction. The over-tenant must file the proper Court procedures in bringing a dispossess action in the proper Court. Assuming that such an action is successful, the over-tenant would then obtain a warrant and judgment, which would allow her to evict the subtenant, usually with the assistance of a marshal or sheriff. Our firm has extensive experience in dealing with tenants and subtenants, and bringing dispossess actions on behalf of landlords as well as tenants who seek to evict their subtenants. We welcome all inquiries in this area.